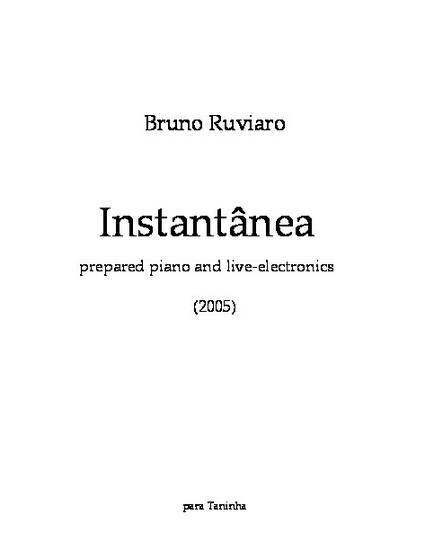 Instantânea was commissioned in 2005 by Brazilian pianist and composer Tania Lanfer. The piece is in fact consists of two short pieces, two “instantaneous” movements. The first concentrates on sounds less commonly associated with the piano. The second brings back the traditional timbre of the instrument and subtly modulates it electronically. Prepared piano and live-electronics. [ca. 6’00] Premiered by pianist Tania Lanfer (to whom the piece is dedicated) in Rio de Janeiro, XVI Biennial of Brazilian Contemporary Music, November 6, 2005.